More than one million people died during the Irish Potato Famine of 1844 – 1852, when a blight decimated Ireland’s potato crop. Widespread starvation was further exacerbated by outbreaks of typhus and cholera. The barbaric policies of the ruling British government – and the greed of those who sought to profit from the plight of the Irish – fomented one of the blackest episodes in Western history. One of these ships, however, never lost a passenger. The three-masted barque Jeanie Johnston completed eleven immigrant voyages from the port of Tralee in County Kerry to Quebec City, Boston and Baltimore without any loss of life. In this meticulously researched narrative, Kathryn Miles recounts how a few individuals endeavored to succeed against all odds. Through the efforts of shipwright John Munn, importer/exporter Nicholas Donovan, captain James Attridge, first mate Thomas Campion, ship’s physician Richard Blennerhassett and the heroic crew of the Jeanie Johnston, more than 2,000 people arrived safely in the United States and Canada. Interwoven into this tale of courage, endurance and compassion is the true story of Nicholas Reilly, who was born aboard the Jeanie just before her first voyage from Tralee. In the late 1990s, a group of Irish citizens decided to build a replica of the Jeanie Johnston to honor her famous namesake. The vessel was completed on 2001, and the author saw the ship while visiting Ireland in 2004. “When I learned about her remarkable legacy,” she says, “I was hooked.” Miles supplemented her exhaustive research by sailing on the Jeanie as an apprentice. Kathryn Miles is a professor of environmental writing at Unity College in Unity, ME. She is the author of Adventures with Ari: A Puppy, A Leash & Our Year Outdoors and dozens of articles that have appeared in publications including Alimentum, Best American Essays, Ecotone, Flyway, Meatpaper, and Terrain. She lives – and sails – in Belfast, ME. 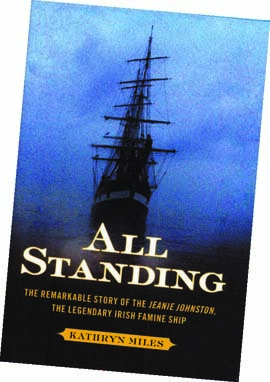 All Standing is an engaging story of the amazing will of the Irish people. Ask your favorite independent bookseller to order it. The Jeanie Johnston Tall Ship & Famine Museum is berthed at Custom House Quay in Dublin, Ireland. Visit jeaniejohnston.ie to learn more.